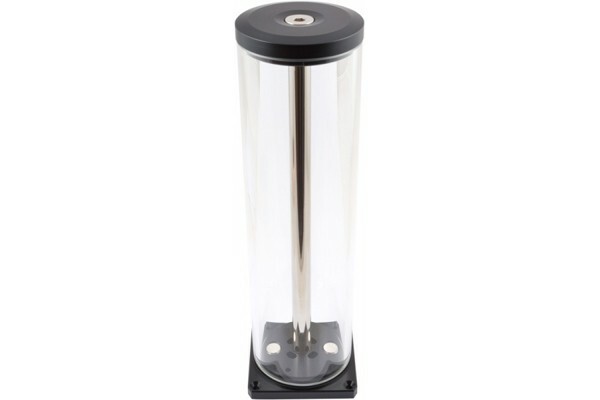 The aqualis bases for pump adaptors are equipped with connection flanges at the bottom and can only be used with a suitable aqua computer pump adaptor! Special features Item No. 45340, 45332 and 45345: An optical highlight is the integrated water column effect: If the middle thread is used as the inlet, the coolant will flow through the brass tube to the top of the reservoir and exit via the eight openings, resulting in a great effect especially in combination with lighting. A thin Plexi plate near the bottom of the aqualis reduces the air intake into the cooling loop to a minimum. An additional Plexi window is integrated into the bottom piece, offering space for installation of up to six LEDs (type 5mm). All 450ml versions are also available with a Nano coating which lets water drip off of the inner wall of the glass tube. Please note: The reservoir can only be used in combination with a suitable pump adaptor, please order a suitable pump adaptor separately.